ZyXEL has introduced a new LTE Advanced Cat6 router LTE4506 for stationary use. Upgraded from LTE Cat4 technology, the LTE4506 router allows speeds of up to 300 Mbit/s in the downlink and up to 50 Mbit/s in the uplink via the LTE network and uses its Carrier Aggregation technology, which has been specified in 3GPP Release 10 and in LTE category. 6. The high data rates could also be achieved at the terminals, because the ZyXEL LTE4506 has WLAN ac and Gigabit Ethernet. Following the Huawei E5186 router, which is available as Telekom Speedbox LTE III , the ZyXEL LTE4506 is the only LTE Cat6 router that has been officially announced for the German market. While there are now a number of mobile wireless routers supporting the LTE Cat6 battery and for stationary use, they are very similar in specifications and features. The ZyXEL LTE4506 router supports FDD-LTE bands at 1,3,7,8 and 20 and TDD LTE band 38 and band 40. The relevant frequency ranges 800, 1800 and 2600 MHz for Germany, Austria and Switzerland are thus supported and may also are bundled via carrier aggregation, so that up to 40 MHz frequency spectrum can be used in the downstream. The body of ZyXEL LTE4506 looks like Huawei E5180 LTE Cube, but it’s a LTE wireless router. The LTE4506 LTE Router can be powered wirelessly via Dual Band WLAN 2.4 GHz and 5 GHz, 802.11a/b/g/n/ac of up to 300 Mbit/s are supported in parallel, according to ZyXEL. Up to two wireless networks can be built at the same time, if there is also a guest-Fi function, however, is still unclear. Up to 32 devices can be simultaneously connected to the router. If necessary, you can also connect a terminal such as a desktop computer or a switch via the network cable to the RJ45 Gigabit LAN port of the ZyXEL LTE4506. The ZyXEL LTE4506 router is powered by a classic MicroUSB connector, there is no built-in battery available in the LTE router. 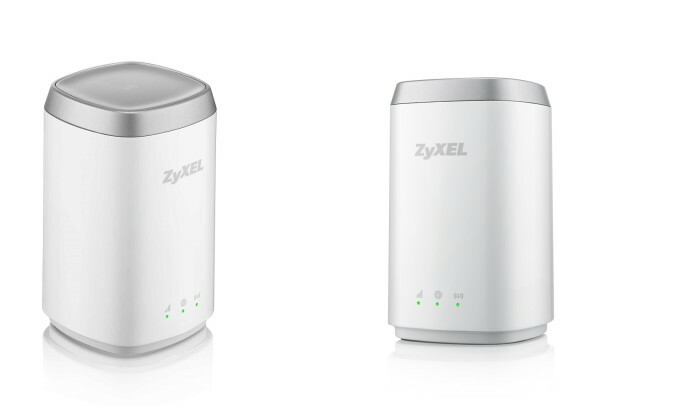 ZyXEL offers the WAH7706 to a similarly equipped mobile WiFi hotspot with LTE Cat6. Someone may want to change their 3G Routers to 4G LTE router such as ZyXEL LTE4506, however, the main problem is that ZyXEL supply the 4G Routers mainly for European network providers. If you are located in Asia, you may have trouble to get one. Thus, the Huawei E5186 is easier to get.